Standing majestically in one of the most fashionable area of Rome the Borromini is a beautiful hotel blending modern design and traditional elegance in perfect harmony. The hotel welcomes its guests with its stunning decor and warm hospitality tastefully decorated reception rooms create an atmosphere of lavishness and excellence. The spacious bedrooms bathed in light and preciously furnished are an oasis of relaxation with all modern comforts. For the best selection of cocktails guests can idle in the exceptional enticing atmosphere of the lounge bar. 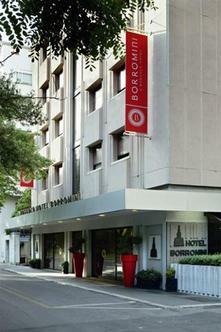 To business travelers the Borromini offers the most modern equipments in a luxurious setting. The functional conference center with the latest high-tech equipment and the highly trained professional staff is the perfect setting for any business requirements.